With the zen-like master Owen Bailey leading this programme, this was going to be an exciting ride, and as the newest member of the GSL team, my first toe-dip into the GSL world, I couldn’t wait. The programme kicked off with an inspiring plenary from Owen and introduction to Day 1 which is all around Knowing Yourself and transitioning from Good to Great. It’s a rare opportunity to really delve into what makes you, you, and how to use your strengths in a positive way. Despite struggling a bit with Raising the Bar, those pesky tent poles (! 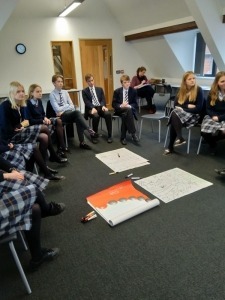 ), the students all valued the experience, especially the chance for reflection at the end of the day. This is where the seeds really get sown and ideas get sparked, Passion for Change is just that, and finding theirs was all to come. 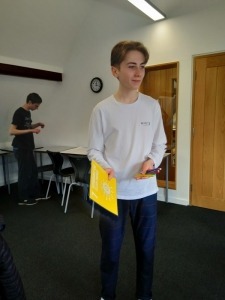 Starting with the idea of Utopia really got the brain-juices flowing; the group presented some brilliant and entertaining versions of what this could look like, and as the morning unfolded the participants really started to engage and come out of themselves. 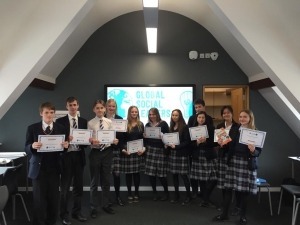 It was great to be joined briefly by Ella and Billy, part of last year’s winning GSL team, to offer support and guidance when examining the Current Scenario and how to distinguish global and local issues. 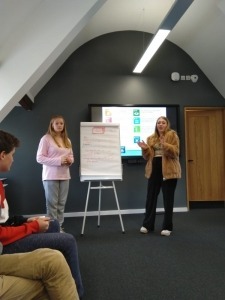 Ella shared her experience and how GSL has helped her grow as a person, she also made the important point that a project can start by doing some research into what’s needed in a local area, finding those gaps, starting small and close to home is just as valid as what might seem a bigger world issue. 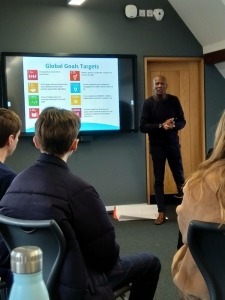 Introducing the UN’s 17 Sustainable Development Goals and getting tangled up in the interconnectedness of them, as well as analysing case studies got the group thinking about their own projects and how they could make a difference. The final day was to be a short day to allow for a long weekend at home, so the focused morning was all about Making it Happen. 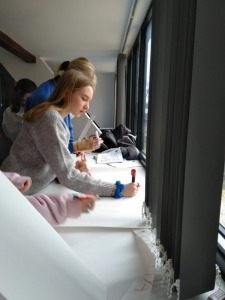 In their teams it was time to start thinking through their projects and planning for action. The culmination of energy and new ideas was being channeled into project plans, and was brilliant to see. To really harness this desire to make an impact, we allowed a last minute entry to this year Global Goals competition, the teams will have until 1st May to get their projects off the ground and see tangible results. Wishing them so much luck, I can’t wait to see the submissions. 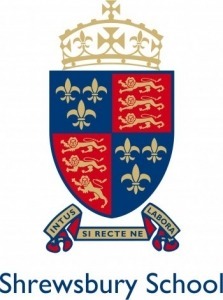 As my first experience of a GSL programme I’ve come away thoroughly energised and eager to spread the word. Seeing those ‘penny drop’ moments and realisations that YOU can make an actual difference to the world, in however seemingly small a way, was something I’ll never forget.